Home › Yarns › Naturally dyed loveliness from Woolly Mammoth Fibre Co.
We have a brand new yarn! Woolly Mammoth Fibre Co. was debuted at Loop during Edinburgh Yarn Festival, and we now have it in our London store as well as online. We have two different yarns from Woolly Mammoth, and we’re so happy to welcome them to the selection of wonderful naturally dyed yarns we already have in stock at Loop. We are also running a giveaway this week, with a beautiful bundle of Woolly Mammoth Natural Sock minis up for grabs! Keep on reading to find out more. Woolly Mammoth was founded in 2017 by Emma Robinson. All of the beautiful yarn is hand dyed by Emma in Northern Ireland, on the North Coast. Emma is passionate about unusual or interesting sheep breeds, and this is reflected in the yarns she chooses to dye and to work with. All of the Woolly Mammoth yarns we have at Loop are non-superwash and breed specific. Both of the yarns we carry are a Blue Faced Leicester/Cheviot blend, which is soft and springy. All Woolly Mammoth yarns are naturally dyed. Emma uses plants that have been foraged from her local area or home grown in her garden, or scraps that have been salvaged from kitchen waste. The soft colour palette is inspired and informed by the Irish landscape on Emma’s doorstep. 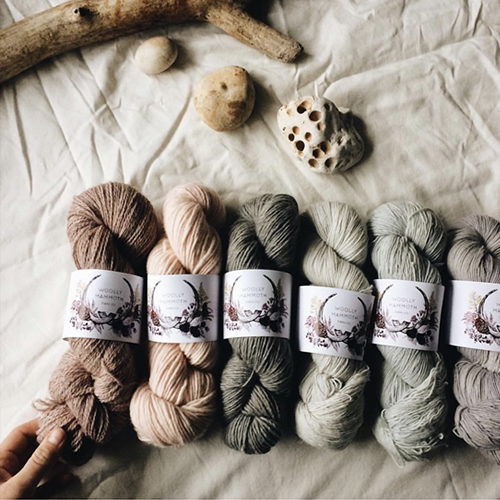 Loop is carrying two yarns from Woolly Mammoth Fibre Co. We have the Natural Sock minis, which are sweet bundles of five 20g mini skeins, each a different colour, wrapped with a small piece of Irish linen. We also have the Natural Sock, which comes in 100g skeins, with 400m per skein, so there’s plenty to play with in just one skein. The fibre for these yarns is 50% BFL and 50% Cheviot, and has been sourced and spun in the UK. It has a high twist, which means it is comfortable to wear against your skin, but it’s also very durable. Woolly Mammoth Natural Sock is of course perfect for knitting socks, but it would also be wonderful knitted into a lightweight sweater or cardigan, or a beautiful shawl. There is a wonderful write-up all about Woolly Mammoth yarns, and Emma’s practice, in the newest issue of Laine Magazine, which we have just restocked! Jonna of Laine came to visit us at Loop this week, and we were so thrilled to see her! We’ve put together a few pattern suggestions for our newest yarn; we think these would be wonderful knitted up in the Woolly Mammoth! First up, our Loop Toe-Up Socks are perfect for the Natural Sock base. This is a free pattern for toe-up socks with an afterthought heel, and is a go-to in the shop when we want to knit a sample in a new sock yarn. How cute would a stripy pair be, knitted with the Natural Sock minis? The Under The Milky Way shawl would be gorgeous knitted up in the subtle shades of the Natural Sock – there are so many colour combinations to choose from! And how about a breezy top for the Spring? We’d love to see an Ara Tunic knitted in one of the beautiful semi solid colours from Woolly Mammoth. 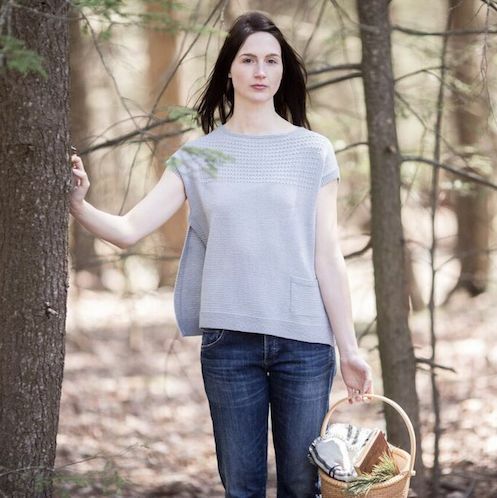 This lightweight top from Quince & Co would be a great choice with the springy Natural Sock base. As always, if you spot a colour from Woolly Mammoth that is out of stock while you’re browsing, please do send us an email and we can add you to our waiting list for the next delivery! Now for our exciting giveaway! We will be giving away one set of the Natural Sock minis (previously pictured) to one lucky person this week. This giveaway will close on Thursday 11th April, and we will announce the winners on Friday 12th April. All you need to do is leave a comment on this post, and we will enter you to win! This is open to everyone, so no matter where you are in the world, we can post to you. Good luck everyone! What beautiful yarn. I’d love to enter the giveaway. Thank you. I love the soft colors!!! Fingers crossed!! Dye made from kitchen waste is intriguing! What lovely yarns and gorgeous colours. How wonderful are those colours all gorgeous lovely natural colours ! Simply delicious. What lovely colours, so natural. I would love to knit some socks in this wool ! Really beautiful colors in this bundle! (Really!) :) My favorite colors muted! Beautiful colours, and the. Exciting to try different breeds. What lovely colours! And naturally dyed too. What a treat! Love the colours and would love to try the yarn. Such a lovely colors! A few months ago I learned myself to knit socks and I love it. Would like to try the toe-up pattern. The palette of colours is so subtle and so beautiful. The colours are really lovely. This is a beautiful bundle. Love this natural sock base, my favourite pair of socks by far, and the colours mix and match so well together. Oh, such beautiful colours and squishy wool! One day I will visit your beautiful shop in London, Brexit or not! One of my favourite yarns, so exciting that loop is now stocking! What a gorgeous yarn – thank you for telling us all about the yarn structure and the inspiration for the colours. I would love to try out the yarn by making a pair of Loop toe-up socks for my lovely auntie Eva. I didn’t make it to EYF this year but if I had, this is one of the yarns I would have tried to squish. Will just have to come to the shop to have a look instead. Wow, these colours are amazingly beautiful. I’m already dream knitting. I second what Kat wrote: I’m longing for a visit to your shop, come brexit or no brexit. And the yarn in this post Would love to get my hands on it!! I love Emma’s yarn. Her sock base without nylon, superwash and naturally dyed to boot was a real revelation. I think being non superwash is fabulous. I’m happy handwashing my handknits. I love the mini colour mix, so soft and gentle. Ive not knitted with BFL yet, would be interesting to see how different it is to merino. I have used Emma’s yarn to make a shawl. I would love some more to add to my stash! I would love to win this lovely give away for my mum as she is crazy over knitting,socks,sweaters anything really. She is my steady rock in this world! I am imagining this lovely yarn in my hands, on my needles and then on my feet. Such wonderful soft colours. I can see the Irish in them. 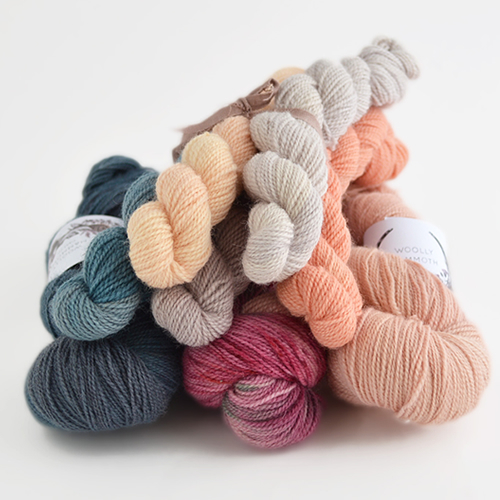 Beautiful soft natural colours from Woolly Mammoth! This look of muted shades is perfect. I Wish I lived nearer so I could come and feel the squishy! Such amazing colors and it’s awesome that it’s all natural dyes! Seeing this yarn makes my heart sing and my fingers wriggle! Lovely soft colours for spring ! Such beautifully soft and delicate colours! Fabulous looking yarn, and what amazing colours to bring from natural dyeing! Here on the Isle of Man, we’re close to Emma’s home (can see the mountains on a clear day!) and I’m thinking of sourcing some of our local Loaghtan sheep’s fleeces to try out my own yarn next year. I’ll be ecstatic to develop anything as gorgeous as this. Wow I love these colours!!! These are lovely! The natural colours and subtle shades are perfect. How wonderful it would be to knit with them. These look soft and such on trend colours! Just looking at them makes my imagination soar! Thank you for choosing such lovely new yarns for your shop! Thankyou for choosing Emma’s beauty yarn to stock. I love how the soft naturally dyed colours look and non Superwash yarn is making my knitting more interesting these days! We have all commented on the colours, they are lovely! Lovely yarn, I already have bought some of her sock yarn and I would love the mini set. The colors are so soft en pretty! Absolutely stunning! With the little bundles, what could you knit with one skein? I’m new to knitting and I’m still learning about gauges and skein length. To win those yarns, oh, such a wish! So ‘joy’ upon my face is writ. Emma’s yarn is beautiful … and she’s a very lovely lady too!! I would love to win this beautiful yarn! Beautiful soft palette of colours! The yarn seems to be very soft and squishy! How I love the beautiful yarn and colours of Emma’s magical creations. Thank you for the opportunity and amazing discoveries you present us. What beautiful soft colours! Stunning yarn! The yarn is so beautiful and the colors so delicate! The yarn is beautiful and the colors so delicate! At last! Truly how true wool should feel look and be a pleasure to use. Beautiful colors. I would love to use this for the Ince Again sweater by Debra Gerhard. Such beautiful, dreamy yarn. I would love to see socks made from this yarn. Ive been waiting to knit my first pair and this would be yummy yarn for that. This yarn looks wonderful – perfect for a bit of colourwork. Such soft, neutral tones. I’m already dreaming up something lovely. So lovely. Love naturally dyed colours! What wonderful colours – a summer shawl beckons! I‘d love to use Emma‘s beautiful yarn one day. It looks gorgeous and I love her sustainable way of doing business. Looked and touched the amazing Wooly Mammoth saturday, so pretty!! Emma’s work is absolutely exquisite! She is one of my favourites! I’m so excited for this giveaway! Love the subtle colours. Fingers crossed. I love Emma’s commitment to locally sourced and naturally dyed yarns and the amazing colors she is able to achieve. I’ve been watching her podcast from the beginning and hope to be able to purchase some of her beautifully dyed yarn one day – here’s hoping! Love the soft color of this beautiful yarn. I love, love, love this yarn-so lovely! Some friends and I visited your shop for the first time last summer-it was worth the 4,000 mile trip:) My favorite yarn shop, hands down! Oh this looks gorgeous……can’t wait to have a squish!!! I would love to add to my growing collection of her yarn. She is such an inspiration!! These colors are all so soothing and gorgeous! A dream to knit with. Beautifully subtle colours! How calming. I love the soft gentle colours. I tend to gravitate to really vivid skeins, but the items I end up wearing are more often knit with a softer colour palette. Love the subtle hues of these strands. These are glorious ❤️ Happy knitting to the winner! I was so lucky to get the chance to visit Loop in Jan of this year and spent tons of time (and money) there, petting and buying…. Loved my experience there! Thank you!! Emma makes a really good job! Love the the Wooly Mammoth sock minis. The colors and fibers look delicious. Thank you! I LOVE naturally dyed yarn and would be delighted to work with this one. This wool looks sooo gorgeous! 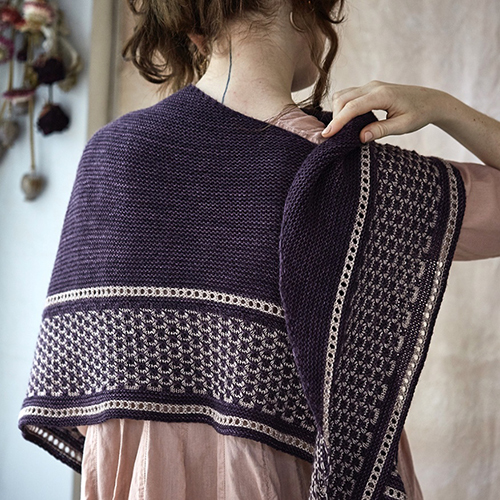 Would love the opportunity of knitting with this one – a beautiful summer shawl! Beautiful yarn and a lovely giveaway! Lovely yarn! Thanks for doing a giveaway! Always in your shop. Very hard to resist coming out empty handed! Love these baby spring colours! This new yarn is very special – beautiful colours. Would love to be able to feel it too. This will looks simply amazing and would knit up beautifully. I really hope I get a chance to try them out. These colours are so soft. I’d love to add a bundle of these to my stash. There are so many yarns I want to try and Woolly Mammoth is high on that list! Naturally dyed yarn is certainly taking responsibility for the future of our world. A very appealing concept. They looked beautiful at EYF as did everything on your packed stall. I would love a set of minis, please. I love her sock base and have yet to get my hands on some of her minis (they’ve sold out every time I tried!). So gorgeous! I’ve been wanting to try her yarn—fingers crossed! Gorgeous colors–perfect for spring sock knitting! Such an absolutely beautiful color pallet!! I love how no matter which shades you mix, all naturally dyed yarn works well together! I’m sure they’ll fly! Oh No! MORE gorgeous yarn to explore – I feel another ‘Loop Day’ coming on ……. 2 hours on a train to London, 2 hours in Loop, 2 hours on a train home. What bliss! Lovely soft yarns!! I would be visiting Loop all of the time if I lived in London!!! You find the colors of the earth + heart. Thank you. Cannot wait to be in camden Passage again and open your door. The colours are really lovely and perfect for spring. So lovely and I bet it feels amazing to work with and to wear. Thanks for supporting and offering this beautiful yarn! I love these beautiful colours and breed specific yarns. And it is wonderful that they come from NI. I love the look of this yarn, and am impressed that it’s non super wash. Bravo for managing to get great colours from natural dyes, not easy! I love the soft colours! Perfect for Spring time! Beautiful colors! Love that it’s naturally dyed yarn. Just lovely! I love the colors and the twist of the yarn. The feel of the yarn is why I love knitting. The colours of this yarn are so delicate. I would love to make a special gift with this yarn. I have admired Woolly manmoth yarns for ages such gorgeous blends and natural colours a real treat! I’m so excited to see you are stocking it! I’m in London in a couple of weeks so will be squishing the yarn at last. Loop you are the yarn space a real utopia for all of us. You make our yarn dreams happen!. Oh I love woolly mammoths yarn … it’s so beautiful!! These are the most gorgeous colours. I love all the projects you suggested but the shawl is calling my name. I’d be thrilled to win this. They look such beautiful yarns. Beautiful yarn and, as always, gorgeous photos. This beautiful yarn would give me the courage to attempt my first pair of socks! Beautiful delicious yarns i would be delighted to win. I love both: Wooly Mammoth yarns and Loop London! This yarn sounds so wonderful! I can’t wait to splurge on some!! Your designs are so inviting. Choosing a color scheme would be so hard because you have delicious color ways for all of the! I’m in love! Beautiful colors and I love that it’s non-superwash! I love these beautiful soft colors. Evoking the colors of the Irish countryside in this yarn makes my heart skip a beat. Such lovely lovely colors. Thank you for this chance to experience them myself. Fingers crossed! Non superwash and naturally dyed… What more can a guy want? Such beautiful, soft colors and combination of wool fibers. Looking forward to knitting with this yarn soon. Thank you for the giveaway. These yarns look so soft I can almost feel them just by looking at the beautiful colours. Would love to knit a garment using all the colours because they are so gorgeous. Great looking yarn! Next pair of socks on the to-knit list. And definitely in this yarn, north coast in NI is one of the most beautiful places I’ve ever been. Beautiful fibres in delicate colours and a lovely giveaway. Thank you. Love the colours. Wish my home dyeing came out like that. Yes, I can see my poor old feet snuggled up in a pair of socks made in this delicious wool. Those naturally dyed colors are so lovely! I loved the sock yarn yesterday. Considering I live in London Ontario Canada, it will be a little difficult to visit your shop. I would love to knit with it though. What beautiful work, both the yarn and the patterns are lovely. I would be gifting this to my Mom, if I were to be lucky enough to win. Thanks for the chance. Beautiful colours and an interesting blend! I’d love to add these to my collection of yarn! Looks lovely to knit with..next visit I will stock up! And could it be true..a pop up in NYC in November?? I’m so there, yes! 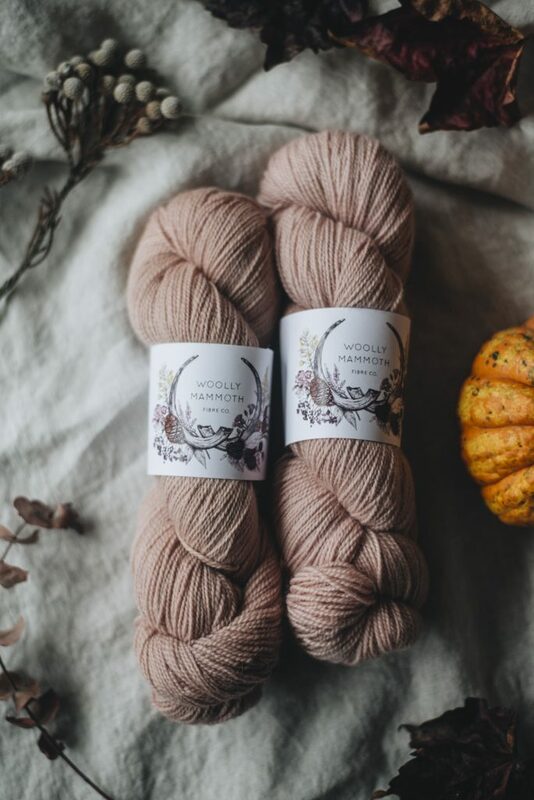 I just love the fact that Woolly Mammoth is not too far up the toad from me over here in Northern Ireland and is sourcing such wonderful yarn in such gorgeous colours locally! 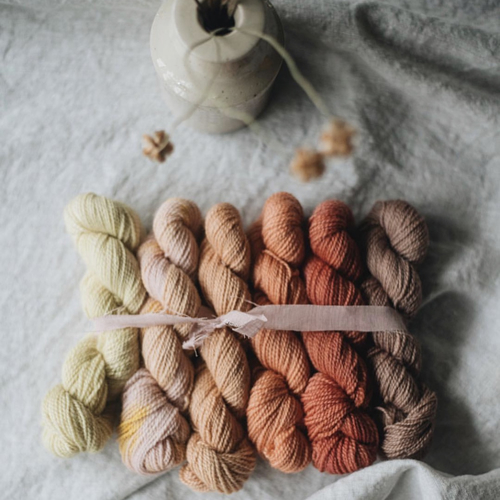 I like the whole wool and natural dye ethos here and would love to win the natural mini sock bundle, tied with Irish linen of course and it would be extra special as my mother’s mother came from Noethern Ireland! The colours are so gorgeous! All the suggested knits are lovely but the shawl is calling my name. Emma’s yarns are so beautiful. I love that they are natural and non-superwash. I managed to snag a few skeins at Alterknit (a woolly shop near Bristol), when they hosted Emma’s trunk show. The skeins are some of the most special in my stash, and I’m hoping to knit them into a lovely sweater design, I’ve had my eyes on, later this year. Thank you for this great giveaway! I’m keeping everything crossed. I love the natural colours that so positively represent and reflect our own natural environment. So harmonious! Am plucking up confidence to attempt to knit a pair of socks. Your giveaway wool looks perfect to use for this “beginner sock knitter.” Thank you. Ahh these colours are so pretty! Would love to try these out on some socks or mittens! Oh these are just gorgeous! I’ve only worked with self-striping yarn with socks so I’m very excited to try working with these gorgeous colours to create unique socks. Those colours are just stunning. I love they are dyed in Ireland- I’m going to visit in September this year. These look so squishy, imagining fabulous projects to use them for!! Very pretty – looking forward to visiting your store in October this year. I love the delicate shades of plant dyed yarns. Beautiful subtle colours dyed by the natural fauna of the landscape – fabulous! Such blissful colours! Would love to make stripey socks. Wonderful yarns, such beautiful colours! How very lovely! She has such soft colours. Gorgeous soft colours, hmm a colour work cowl perhaps. These colours are so beautiful and calm, thank you for the giveaway, Loop! Those colors- just so dreamy! 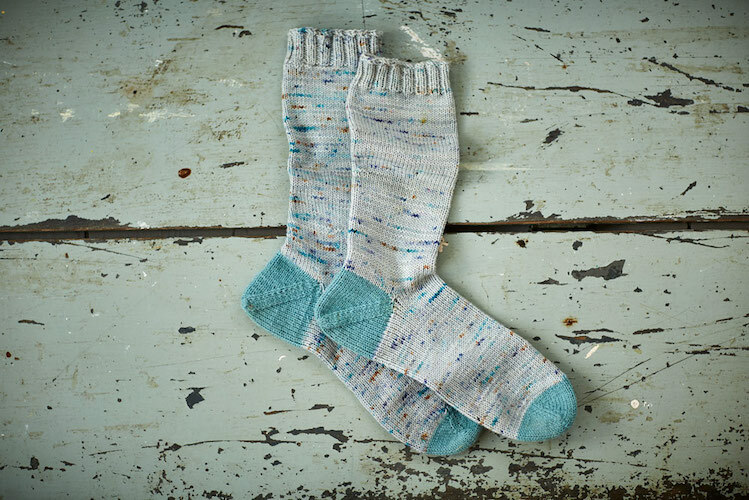 They look so lovely individuals but so perfect together in the mini sock set! So beautiful colors and all natural! Such beautiful colours and perfect for spring! Love your blog, always inspiring. I have a couple of skeins of Emma’s yarn and it is beautiful! Love the colors ❤️ They are beautiful. I shall get a skein for socks next time I’m at Loop because then I’ve always got a new pair of socks to cast on. Such a soft, beautiful, and versatile colour palette! I have NEVER attempted socks-but this would force me to try them! ! Lovely beautiful yarn! Thanks for the chance!